Even though most people are concerned about their own health, I'm guessing that a small percentage of those people don't really think about the health of the company they work for. I would argue that although many employees are constantly searching for that next innovation, simple process improvement would improve the average company just as much. Process improvement is not only about improving, it's also about knowing what is possible. A process is working well if it consistently performs well, and has a low level of daily variance. When looking at a company checkup in terms of its process health, the investment in improvement is not as expensive as first impressions may indicate. In fact, many studies show that it is not the willingness or ability to improve, but the time required that is often the problem. Two popular ways of improving processes are benchmarking and waste identification. Either way, it's all about removing things that do not add value and adding more value where it is needed. Benchmarking is all about using metrics to grade a process. These grades can then be compared to either other internal benchmark grades or external benchmark grades dealing with similar processes. Internal comparisons are used for continuous improvement from where the company was previously at. External comparisons are used to find out how well a process compares to the best versions of those processes on a local, national, or even global scale. 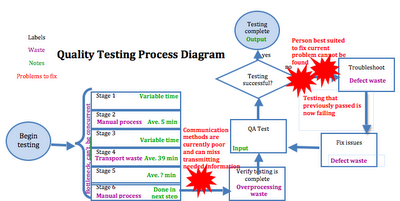 Process diagrams are simply what they say they are. A flow of beginning to end for a process. This includes preparation for the process, the process, and any cleanup. It also includes inputs, outputs, capacities, times, and bottlenecks. It is sometimes a good idea to limit the process to be improved to just a portion of the whole process if it is very complex or big. In this case it is common to Plan, Do, Check, and Act (PDCA). PDCA is really just a business version of the scientific method. 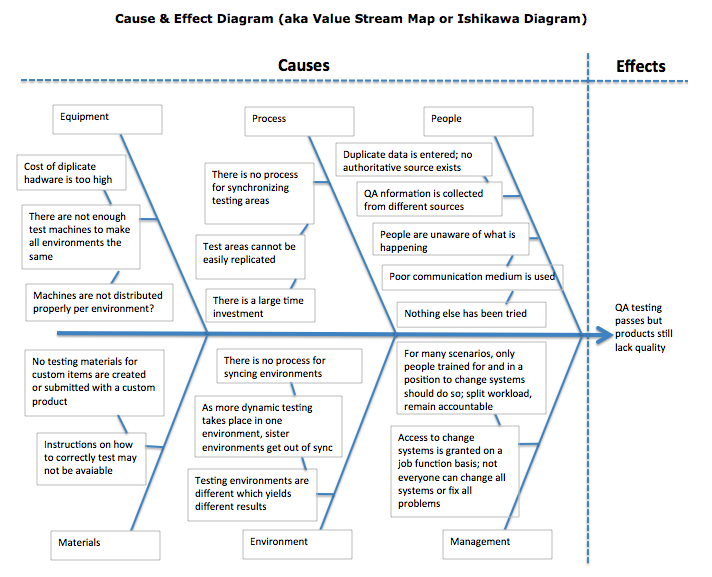 Cause and Effect diagrams are useful for finding root causes to problems. 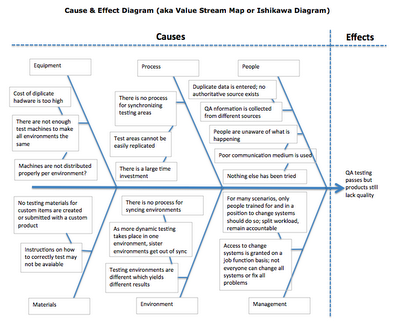 Looking at the following diagram, you can see why some people call it a fishbone diagram. Every time there is a reason for the effect, an attempt is made to find a lower level cause. 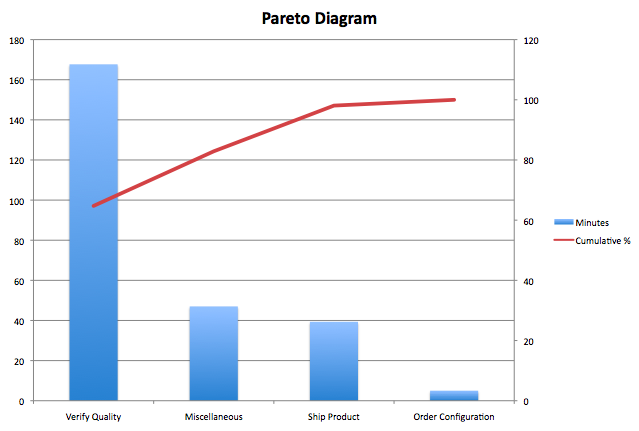 Pareto charts are cross plots of specific problem types vs total problems (relative vs. absolute). They are useful in showing which problem areas should be addressed first. If it is uncertain whether a process needs to be benchmarked or improved, try looking at that process from a customer's perspective and see if you would be impressed or left wanting.